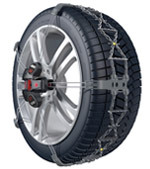 Thule/Konig K-Summit Snow Chains - The smartest solution from Thule/Konig. The Thule/Konig K-Summit XL is designed for crossovers and smaller SUVs up to 2000 Kg empty weight. 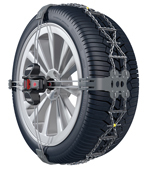 The Thule/Konig K-Summit is one of the easiest fitting external fitting snow chain s on the market. After initial pre-adjustment there are only 3 operations needed to mount the chain. The Thule/Konig K-Summit XXL is designed for larger SUVs over 2000 Kg of empty weight. 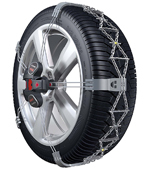 The Thule/Konig K-Summit is one of the easiest fitting external fitting snow chain s on the market. After initial pre-adjustment there are only 3 operations needed to mount the chain. The Thule/Konig K-Summit VAN is designed for vans and RV’s up to 3500 Kg of empty weight. 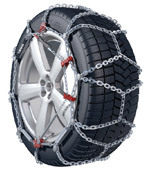 The Thule/Konig K-Summit is one of the easiest fitting external fitting snow chain s on the market. After initial pre-adjustment there are only 3 operations needed to mount the chain. 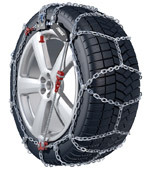 The XD-16 snow chain is a superb example of Thule/Konig's high quality and simple straight forward fitting technology. Easy to follow, step by step instructions, together with brightly coloured components, enable the user to mount the chains in a quick and efficient manor. The XD-16 chain uses Thule/Konig's unique micro tensioning system enabling tightening to be completed with a single addtional stop. Thule/Konig's XS-16 snow chain offers not only simple easy fitting, but uniquely, probably the world's quickest patented dismounting system. Just pull the handle and off they come! Add to these features, a self-tensioning system, and we feel confident that the XS-16 will perform fantastically in all situations.